Popsters Internationa. Ito na ang inaantay nyo . Thank you Gina...Looking forward to this event. It will be held on Sunday, June 2, 2013 @ The Orpheum Theatre, So. Broadway, Los Angeles, California. Tickets will be available by March 15th but you can now contact tito Al to reserve your tickets. 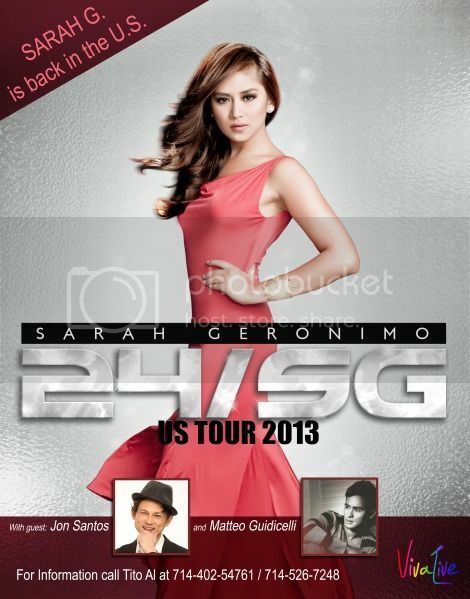 I've been in contact with Tito Al and other Popsters/Ashteam here in southern California. I have requested tito Al to block a section for Popsters/Ashteam (currently row 3, center-26 seats) and he said he can add row 4 if needed. So if you are ordering the VIP tickets and want to be seated with the group please mention it to tito Al....this is not a requirement but just a suggestion so we can all shout "We Love You Sarah" in unison..hehehe! As far as I know, there will also be a Saturday, June 1st concert in the San Diego area, Balboa Theatre (I believe)...have not seen a poster though but I suspect it will be the same just different producer (SPJ3)/contact numbers. Hello SoCal popsters...and of course anywhere in the US, Canada, or any place in the world....in the world talaga....let's support Sarah's concert guys. Hope to see you all at the concert!!! If you're still looking for VIP tickets please let me know soon...I might still be able to help you...depending on how many VIP tickets you need...okay! Thank you for posting tita Aries. I am so glad there is one here in the Bay Area, SF as I am not able to travel to South... i definitely wouldnt want to miss this event... Popsters who are going to Sanfo and are making VIP reservations sana po iisang area or magkakalapit tayo para sabay-sabay yung cheer natin at sigaw ng We Love you Sarah! Here in SoCal (SD & LA) so far popsters have managed to coordinate with the respective producers to designate "popsters" vip section.....sana game din ang lahat sa pagsigaw ng "We love you Sarah!" picked up my/our 14 vip tix from tito al last weekend...best seats in the house...malapit na concert...let's all support Sarah's concert as well..
wow,,,enjoy guys sa concerts...thanks for sharin..